FDimension: Upon Diameter: 5.3"Height with Handle: 10"
The flower basket is used high quality materials, perfect adornment of wedding party. Creating a warm and romantic environment for your wedding party. It is designed for flower girl to use in wedding ceremony party. Besides, the flower basket is also great for holding candy, small gifts, and confetti cards. 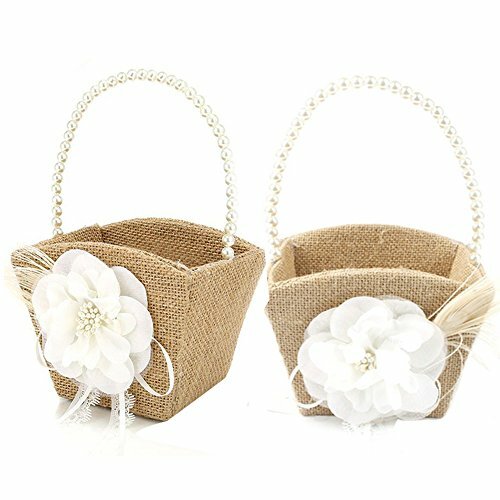 On your wedding day use our simple but beautifully hand-crafted flower girl basket to cradle the flowers and petals youll use to spread flowers and petals on the aisle to bless your wedding with fertility abundance and happiness.Perfect for wedding ceremony party. If you have any questions about this product by Awtlife, contact us by completing and submitting the form below. If you are looking for a specif part number, please include it with your message.